If you use a sling or carrier, you will probably have had at least one person tell you that “those things weren’t around in my day” – they are both wrong and right. Slings have been described as one of the very first pieces of technology, an absolute necessity for nomadic peoples for whom carrying their babies in arms was both impractical and would have meant that mothers needed even more energy, which was in scarce supply. Yet it is true that most of the slings and carriers we see today were produced by companies that were established in the last 40 years. 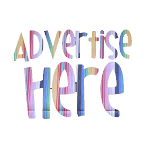 The last twenty years have seen the creation of new products such as stretchy wraps and hybrids and a huge growth in the number of companies making and selling slings and carriers. How did ‘babywearing’, as we may now know it, come about? 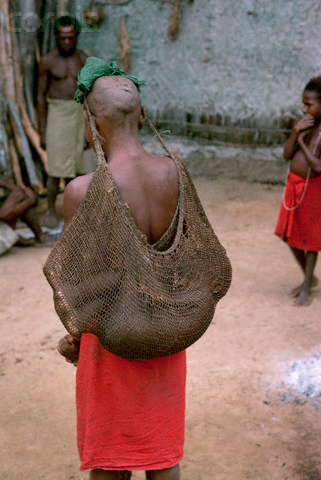 It’s thought that natural materials like bark, leaves and animal skins were initially used to fashion very simple one-shouldered carriers, which helped support some of the child’s weight while adults were moving around from place to place or looking for food. Later, after weaving was used to create cloth, simple pieces of cloth were used to tie the child close to the adult (or to a sibling, as many babies were and still are carried by older children). Sometimes these were very ornate, such as in Asia, where carriers were often heavily embroidered or made from fabric such as the silk of kimonos or kimono sashes in Japan. In Africa, kanga and kitenge fabrics were part of dress fabric used as an apron, a blanket to sit on and a general carrying aid. In Mexico, the rebozo, which was a general purpose ‘carrying cloth’ which each woman carried at all times, was used to carry babies in. In India, women tied babies into part of their saris and in Borneo rattan baskets were used. Closer to home, in Wales the Welsh blanket was used by both men and women regularly to carry babies until the 1950s, when the mass production of strollers meant that their usage virtually died out. 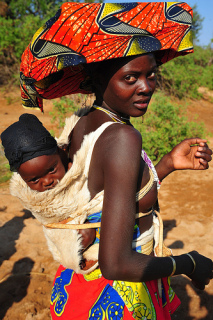 Styles of original baby carrier vary from climate to climate – in hotter climates, babies have a greater need to feed frequently and carriers that keep the baby close to mother (or to another woman who will feed it) tend to be more practical as they allow the baby to have very frequent, short feeds, avoiding dehydration. In colder climates, babies tend to feed less by day and can be left for longer periods so carriers that can be left hanging on tree branches or strapped to sleds may be more practical. The Inuit amauti is a carrier and coat, where the baby is carried inside the coat, which is tied at the waist, less practical for nursing but a great way to keep warm. In the late 1960s, an American woman invented the Snugli baby carrier after seeing African women carrying their babies on their backs, when she worked as a Peace Corps volunteer in Togo, West Africa. In the 1970s, the first German woven wrap company, Didymos, was established after its founder was given a Mexican rebozo. In the early 1980s, the ring sling was invented by a man in Hawaii for his wife. 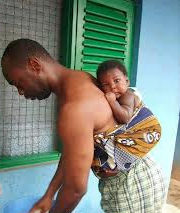 He sold his idea to Dr William Sears, who invented the term ‘attachment parenting’ and whose wife, Mary invented the term ‘babywearing’ after using a sling with their son and describing the sling like an item of clothing that she put on in the morning and took off at night. Since the 1980s, the number of types of slings and carriers has grown hugely (the pouch and soft structured carriers are Western adaptations of traditional carriers), as have the number of new companies, from very large manufacturers to smaller work at home parents making custom-designed carriers. The choice really can be overwhelming though perhaps thinking back to the origins of baby carrying and how the focus should be on the practice of baby carrying and less on the product, may help parents make the right choice. This article first appeared on the Gentle Parenting website.